You guys, we did it. We made a bathroom. 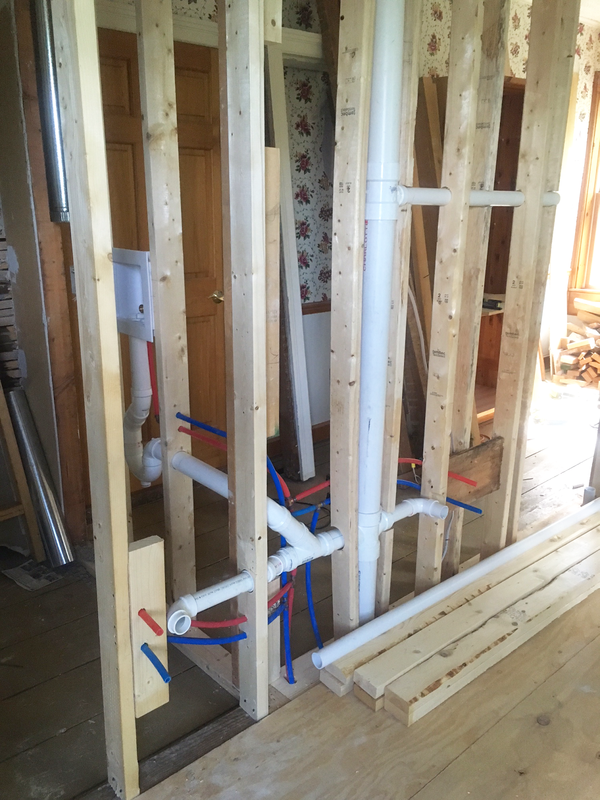 Of all the projects in this house I was most terrified of, this one was it. I feel like, now, we can do anything. But, as per usual, let's rewind back to the beginning. When we bought this house, there was one full bathroom upstairs, and a half bath downstairs off the kitchen. The full bath upstairs was in our master suite, meaning to use it, you had to come into our bedroom. So, we knew right away that we'd have to install a second full bathroom upstairs somewhere, especially if we planned on ever having kids. Or having happy guests. 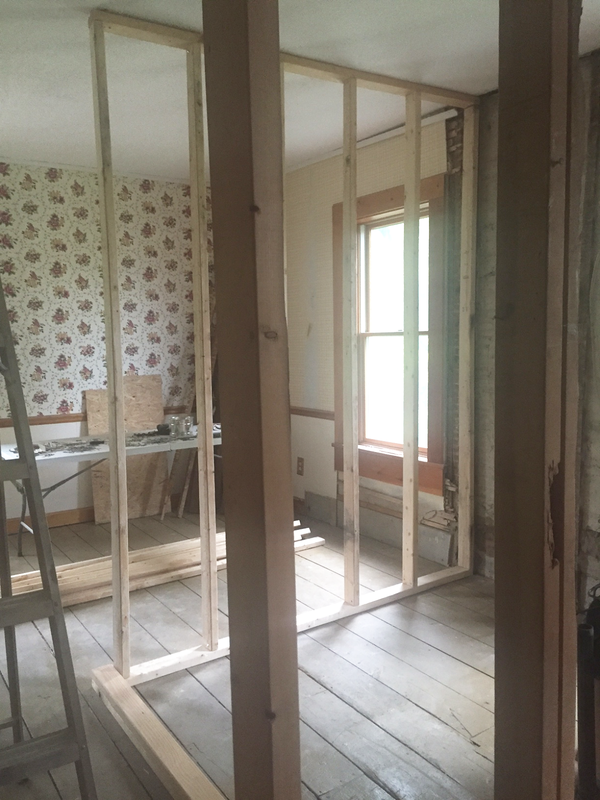 We have four bedrooms total upstairs, and one of them was really big, so we decided to remove a chunk of that, and install our laundry room and guest bathroom in there. 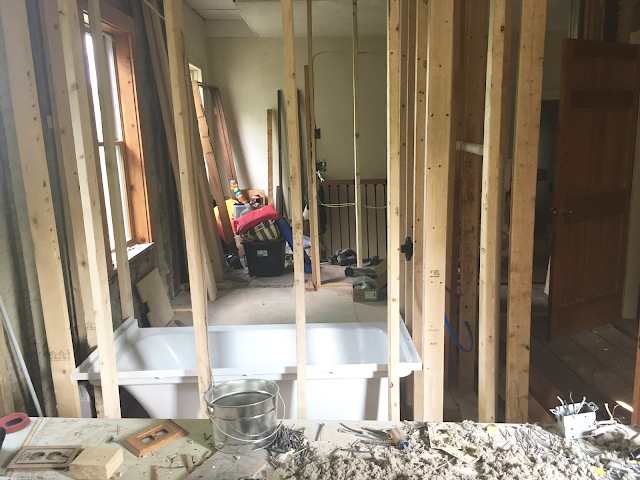 This would require installing all new plumbing and electrical lines, including ripping out our living room walls downstairs to install the plumbing, framing out the space, leveling the floor, drywalling and you know, tiling, installing fixtures, etc. It was a huge project. Oddly enough, though, it's a pretty small space, but it took almost a year to do. 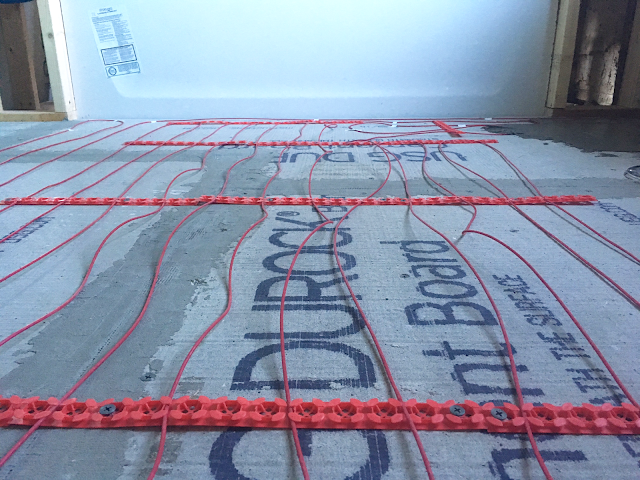 We did most of it ourselves, but hired a professional contractor to install the new electrical and plumbing lines, and level out the floor. 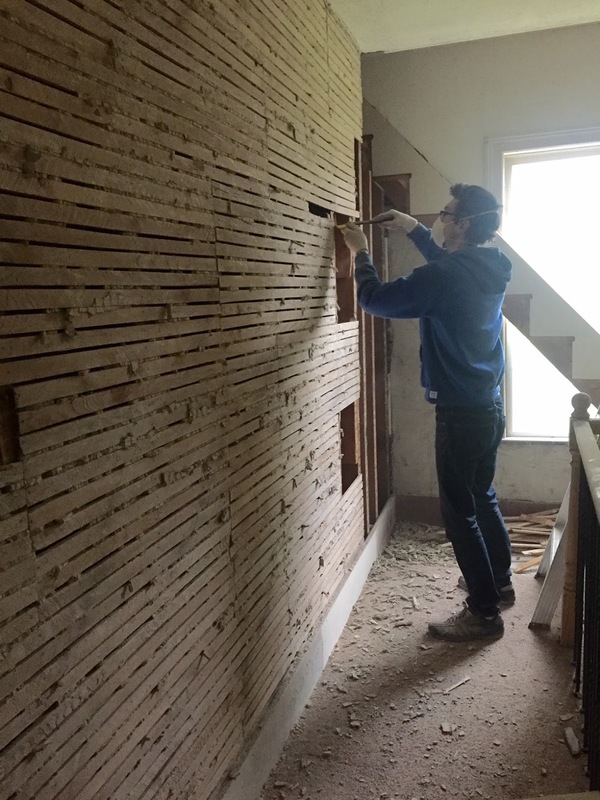 Josh was feeling confident that he could have done it all, but it took the contractor a week, working 8 hours each day. And since we both work full time, and it was fairly complicated, we both decided it was best to have someone else do it because it probably would have taken us months to just get this portion done. This was totally the right call. Everything else, however, we did ourselves. 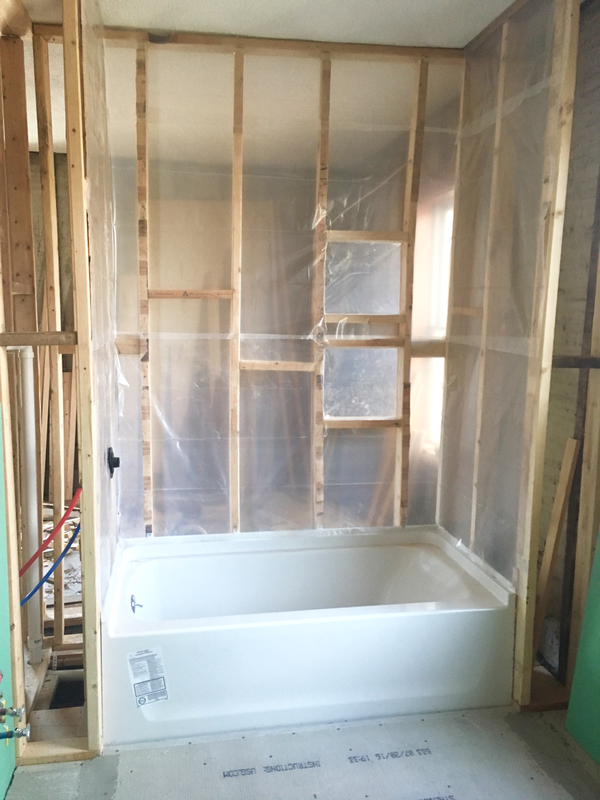 The framing, the drywall, the tub installation, the cement boarding, the mortar, the radiant floor heating, the tiling, the fixture installations, the designing and decor details. 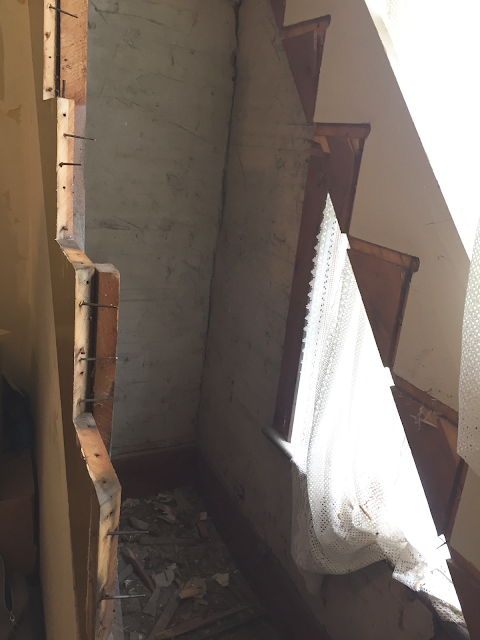 So, to begin everything, we had to rip out all the plaster in this guest room and in the upstairs hallway to make an entrance to the actual bathroom. Part of this process included ripping out a tiny stairway that led to our attic, and installing one of those pull-down doors with an attached ladder. 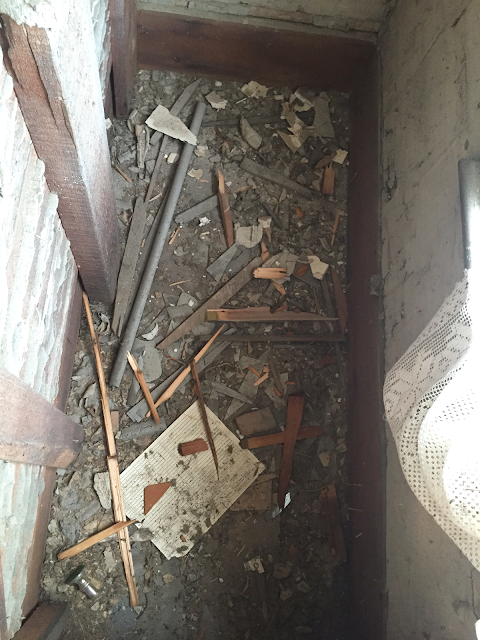 The actual installation of the new attic door was awful. I basically had to stand on a ladder lifting the new door up, so Josh could quickly screw it into place from up in the attic. Fun! 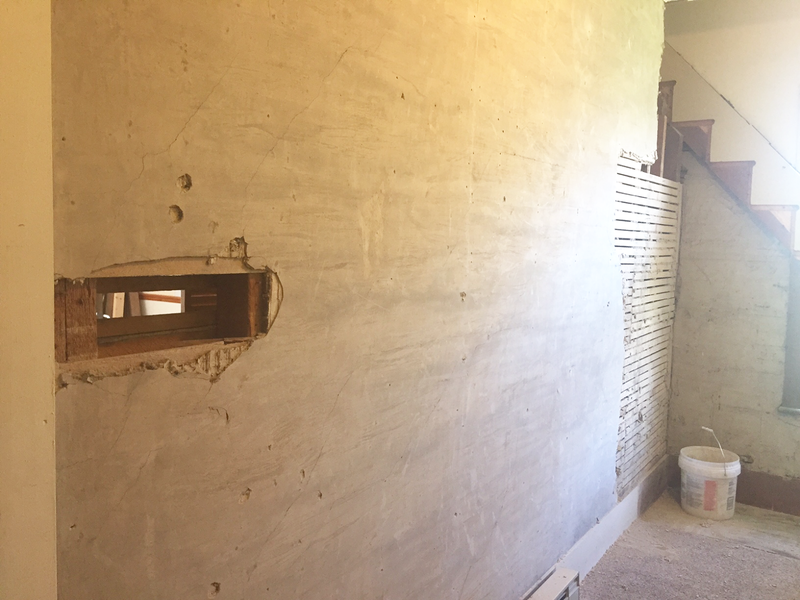 Somewhere after demo-ing out all the plaster walls and the stairway, Josh framed out both the bathroom and the laundry room at the same time. That's when we called our contractor in to install all the new lines and level out the floor to ensure proper drainage. Once that was done, Josh got down to some serious work. 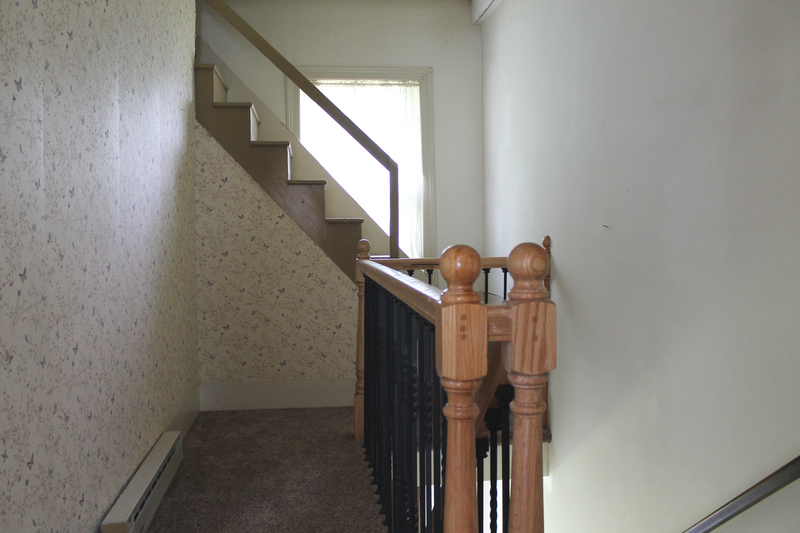 BEFORE: This is our upstairs hallway where the entrance to the laundry room and bathroom are now. 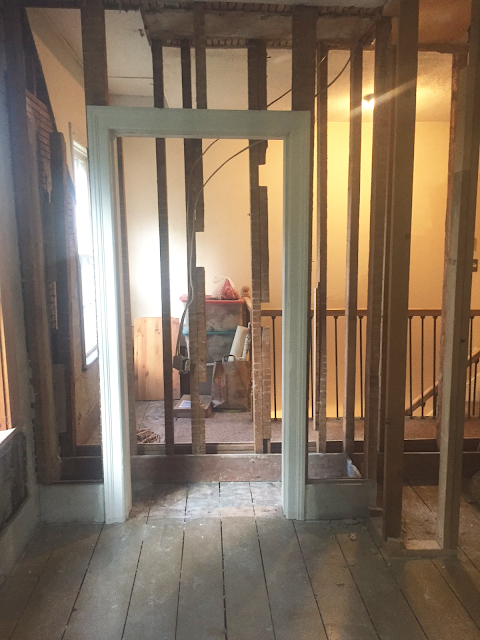 The wall to the left is where the doorways for these two spaces were put in, and we had to demo out this little stairway that leads to the attic. BEFORE: The portion of our guest room that we converted into our bathroom and laundry room. The closet to the right is now our laundry room, and the bookshelf area is now our entrance to the bathroom. The toilet is now right in front of that window to the left. 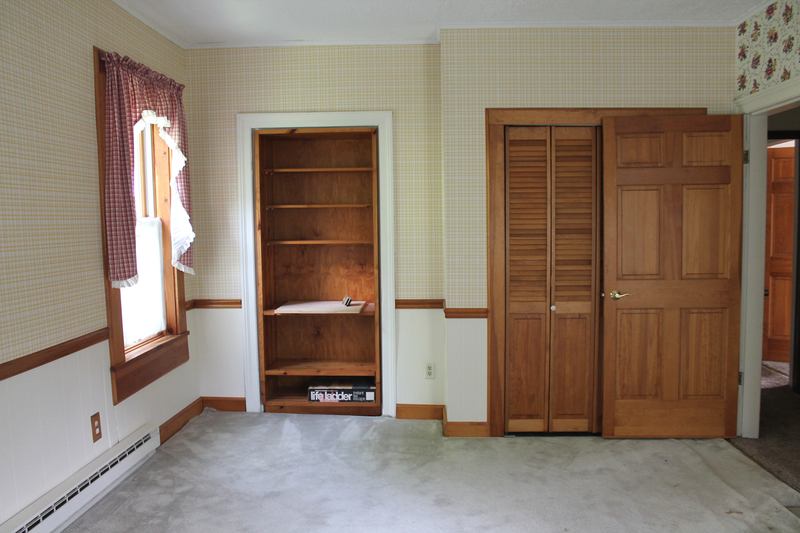 There was an old door hiding behind a built-in bookcase in the guest room. 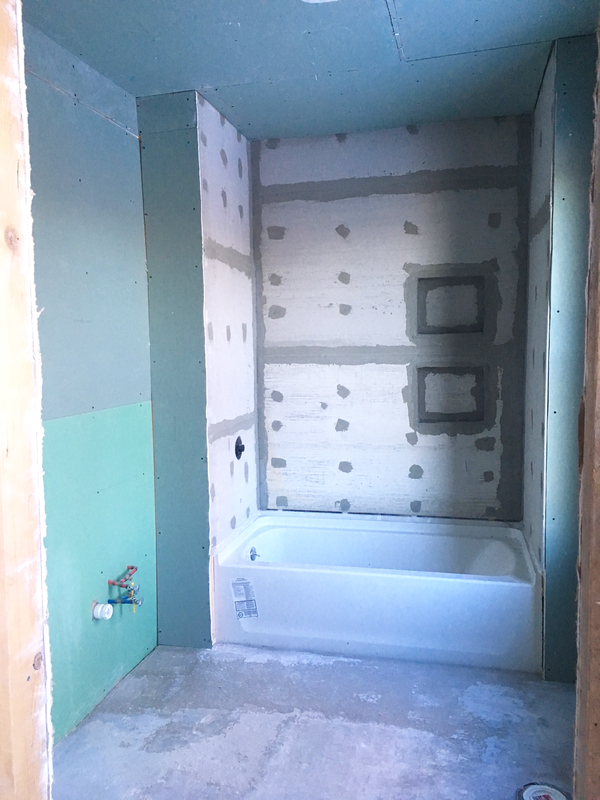 We started by cement boarding any place that was getting tile, or was near heavy water flow - so, the tub, the floor and the back wall where the sink console would go. 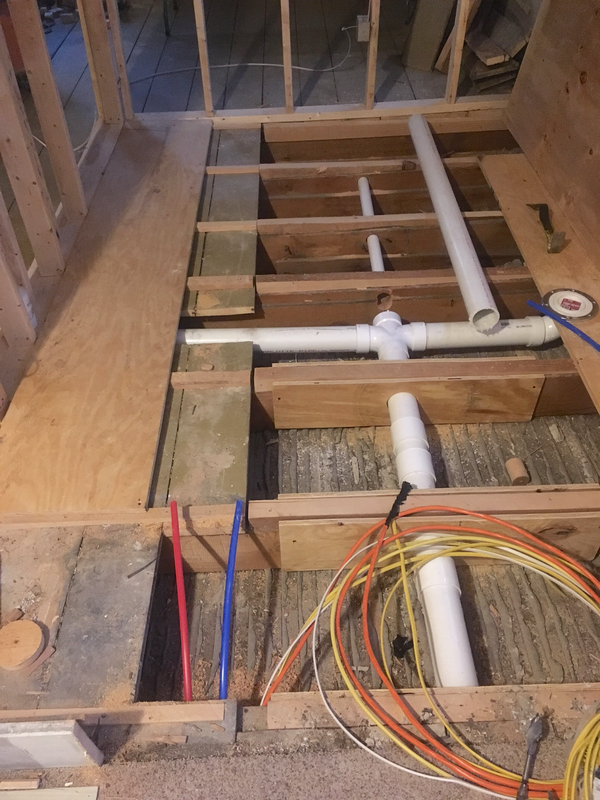 Then Josh laid down the radiant floor heating, and got that connected to the power, and also installed the mold-resistant drywall on the rest of the walls, and ceiling. As I'm typing this all out, it sounds like it happened so fast, but each step took anywhere from a few weeks to a few months. Finally, it was time to tile, and I actually helped a bit with this. 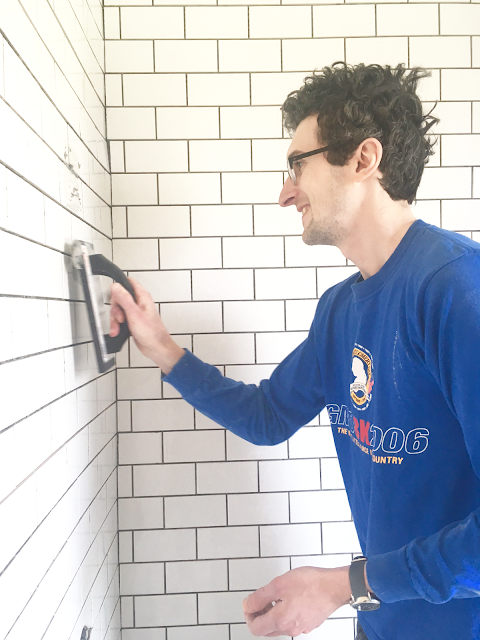 I'm not sure why, but I was super terrified of tiling, and it turns out it's actually really easy to do. It's just time-consuming and tedious if you use subway tile, since each piece is individual. 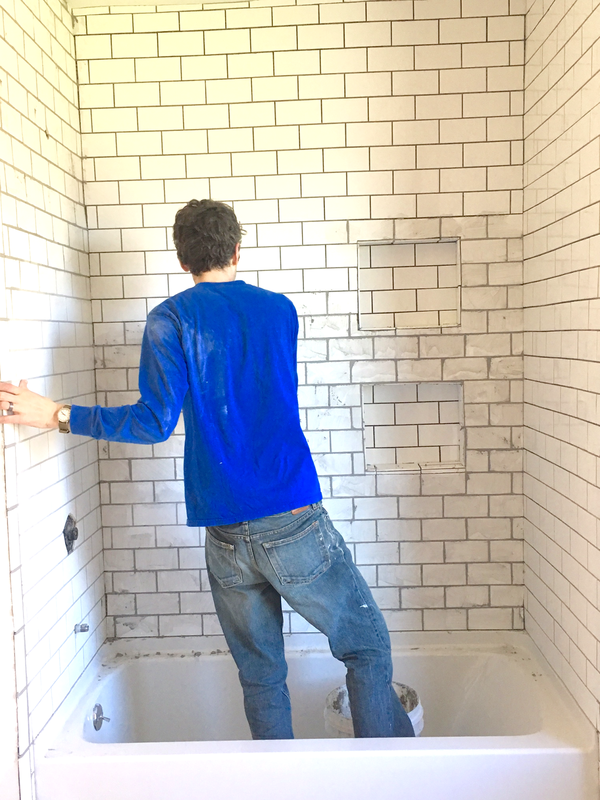 We thought we'd finish all the shower tiling in one weekend, and it ended up taking about three weekends. 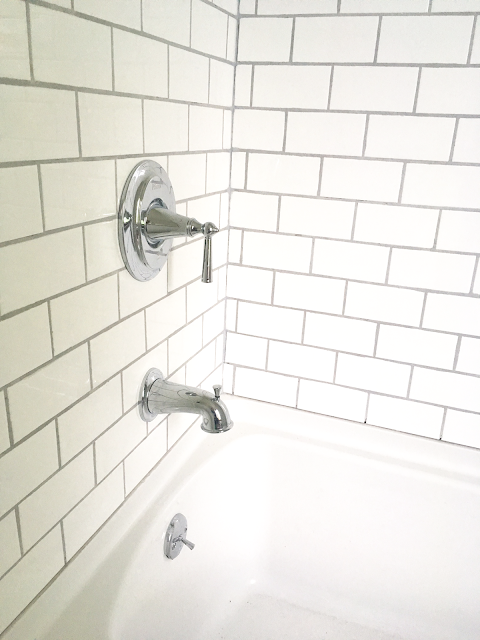 We did white subway tile around the shower, and then did a hexagon tile on the floor. The floor tiling went fast because we got 12x12 mesh sheets, but oh man, that subway tile in the shower was a beast. Josh did most of this because we couldn't turn the heat on in this room until the floor was done, and since we did most of it in the winter, my hands would get so cold that I couldn't even move them after a while. 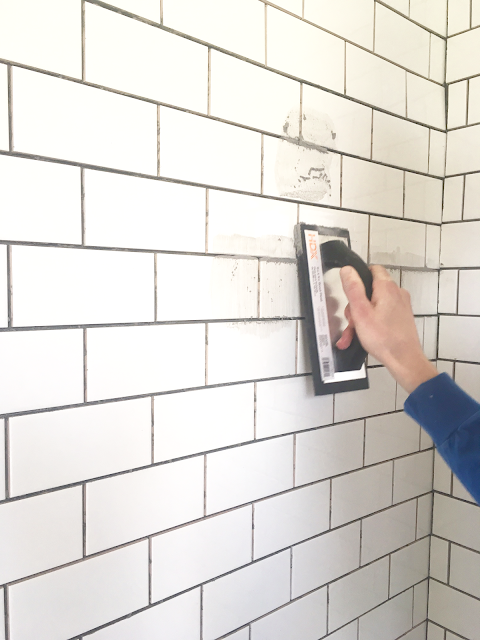 We chose to go with a light gray grout, and holy poop, I never thought I would think about grout color as much as I did. It seems like such an easy decision. No one cares what color is between the tiles, right? But the decision seemed so permanent because, well, it kind of is. That scared me so I way overthought this - should I go taupe to match some of the undertones in the bronze fixtures? Should I just go completely white? Is white too hard to keep clean? Is dark gray too modern? Ugh, it was the most ridiculous first world problem if there ever was one, so in the end I just went with my gut, which was light gray. A little less modern than all white, and not quite as intense as a dark gray. I wanted the bathroom to have a little bit of a cottagey feel to it, so we decided to install a faux shiplap focal wall where the sink console would go. We had already done this in our mudroom using plywood planks, so it was fairly easy and inexpensive to do. 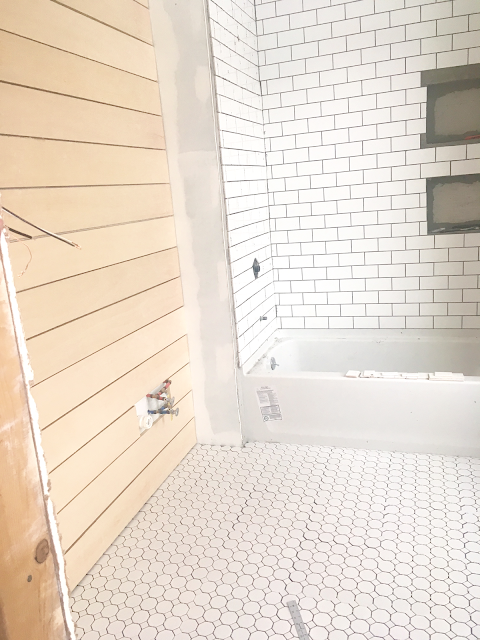 I'm so glad we did this because the whole bathroom is white, and this added a nice level of depth to the design. 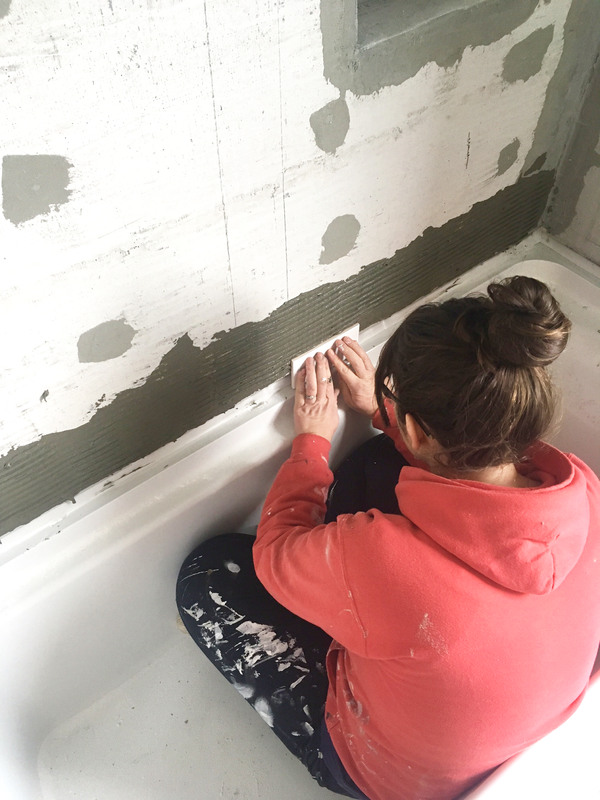 Once the shiplap was installed, it was time to start painting. 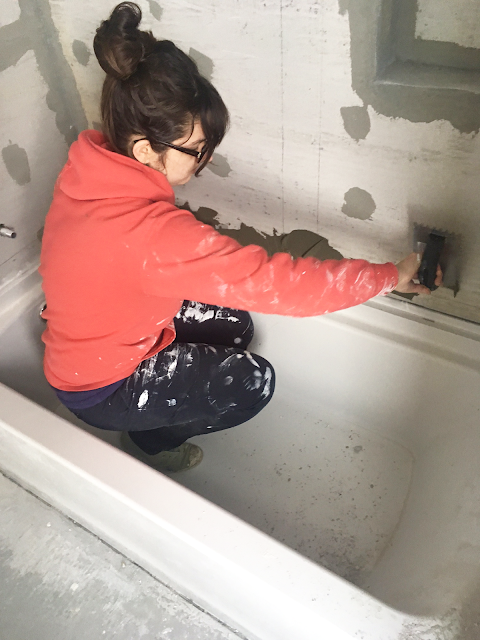 I had two painting projects on my hands: the walls, and the sink console. We've had the sink console picked out for a while now, and actually purchased it months ago because it was on a good sale. I also debated this purchase for a while, and finally chose the perfect one for this space. And of course, it didn't come in white. Every other console in the world comes in white. Except this one. The good thing about this, though, was that one of the colors it did come in was getting discontinued. So I purchased it in antique cream color on a good sale, and then just painted it the same color as the bathroom walls, so it's all completely cohesive. So, I began painting. I was dreading this because after painting our kitchen cabinets, I kind of never wanted to paint another cabinet, especially with this special cabinet paint, ever again. It really wasn't too bad because it's obviously a lot smaller than an entire kitchen, but it wasn't the most fun I've ever had. The sink console came with satin nickel hardware, and I had fully intended to use the existing hardware. But, once I started painting, I realized it was screaming for bronze drawer pulls and door knobs. I'll get more into this in our next post detailing the design aspects, but long story short, I changed the hardware. We decided to keep everything in this bathroom white for the most part because it's pretty small. It needed a light color on the walls, and white bathrooms are just my jam, so it was the easiest decision we had to make. I went with my standby, Benjamin Moore Simply White, the same color as our kitchen because it's so easy to work with, and goes with every undertone you pair with it. 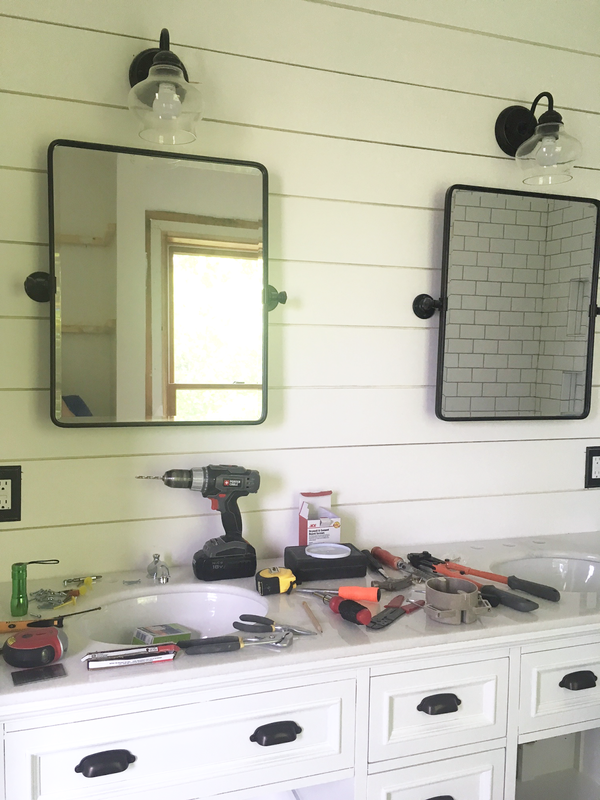 The walls, linen closet, trim and sink console got painted Simply White, and once that was done, we brought in some natural wood and bronze accents. After I finished painting the shiplap, walls and linen closet, Josh got to work on installing the rest of the fixtures and details. 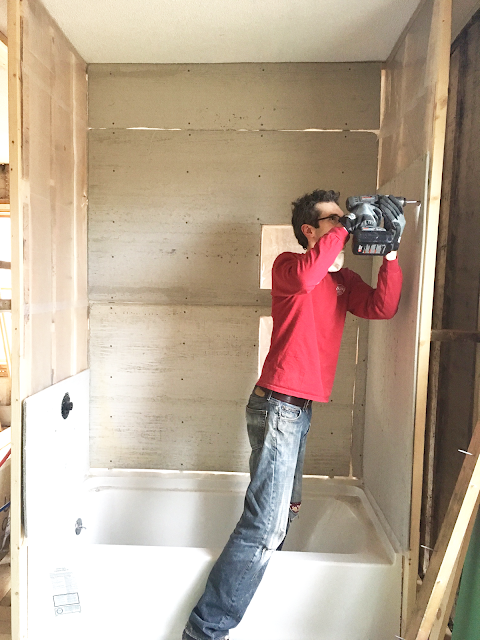 We carried the sink console in (no easy feat, I may add), then the toilet, and then started to install the mirrors and lighting. While Josh installed the toilet and hooked up all the faucets for the sinks and shower, I started to stain the door and the linen closet shelves, and painted the wood for the trim pieces. I just finished all those this afternoon, and I'm waiting for my second coat of poly on the linen closet shelves to cure. 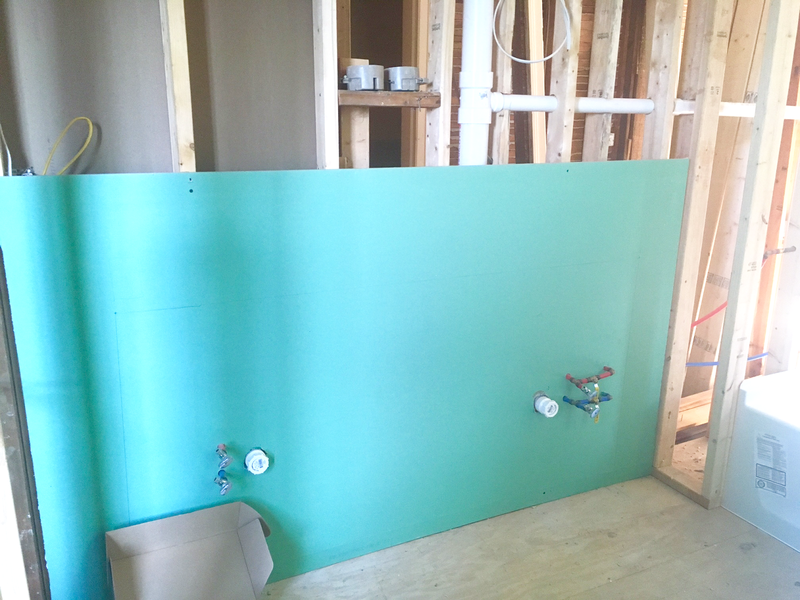 They should be ready to install tomorrow - yay! 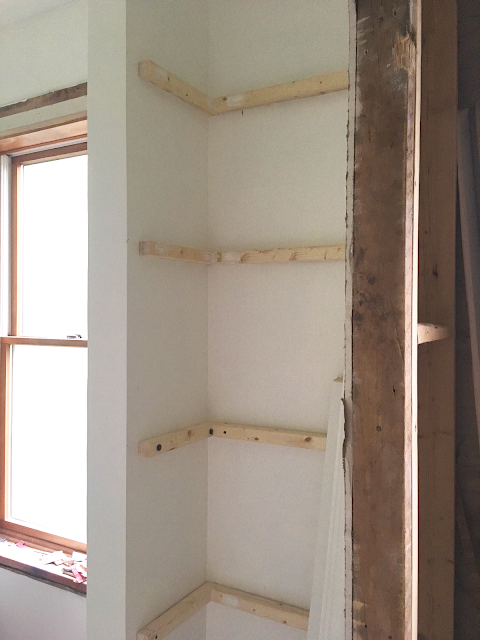 Once these brackets are painted, we'll be installing some rustic pine shelves for our linen closet. Right now, Josh is upstairs finishing the sink faucet installation, and I'm dreaming of this project being done. We're so close. SO close. Within a few weeks, I'll be able to post a complete reveal and before and after. It's go time, friends. 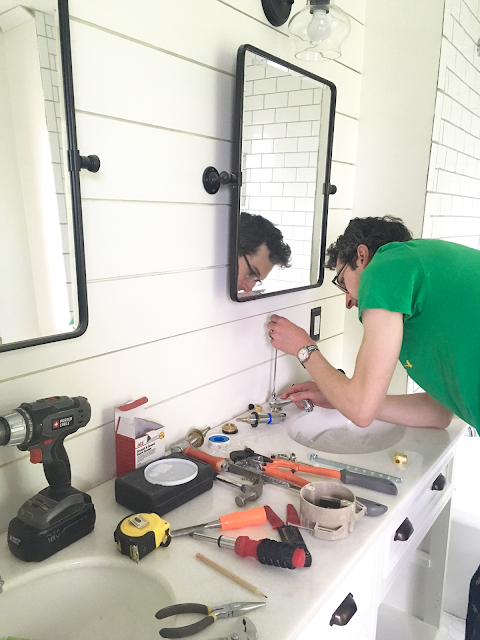 In process: Josh is upstairs finishing our sink faucet installation. I remember watching your video post tour of your new home. You explained the things you wanted to do to it and I thought...oh my goodness, what a job! But you are making it happen and it looks so lovely. Kudos to you and Josh. It's coming along beautifully! What a big project. I bet you are SO ready to have it done! This is beautiful! You are making such a beautiful home. Thanks for sharing. Where did you purchase the mirrors? I absolutely love them and they would be perfect for our bathroom remodel. Can't wait to see the final photos of this bathroom. It seems that you have done a lot of work with this renovation. Congratulations to everyone in advance. 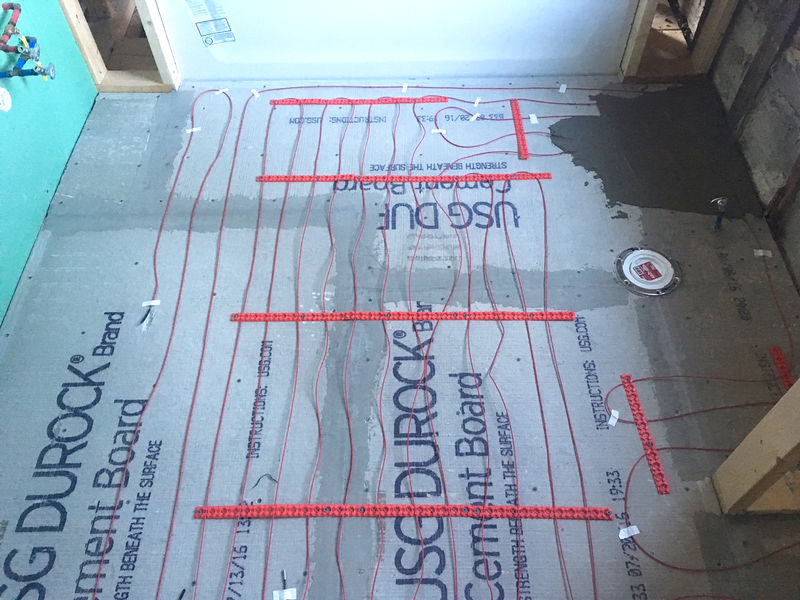 I live in a region that gets flooded easily, so I renovated my home and closely sealed to prevent flooding, and it was done with the help of waterproofing specialists in Pretoria. If you are looking for a simpler, cost effective and yet attractive pieces then the steel one will work perfect for you. For durability, those made from glass, stainless steel and fiber finesse will be good for you.